Making infant and children’s oral health a priority is a key to lifelong health. Children should see a dentist as soon as the first tooth erupts or by 12 months of age and regularly thereafter, just like regular check-ups with their pediatrician or family doctor. 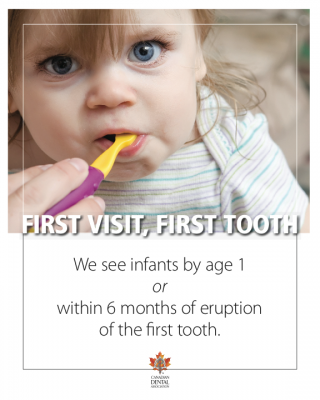 Tooth decay can start as soon as baby teeth erupt into the mouth. That is why it is important for parents to adopt healthy dental practices early. Delaying that first visit can have serious consequences. A Canadian Institute for Health Information report showed that treating early childhood caries (severe decay in the teeth of infants or young children under six years of age) accounts for approximately one-third of all hospital day surgeries performed on preschoolers (ages 1-4 years old). To schedule your appointment, contact us at 519-305-9100 today!